WATERLOO - Maurine K. Blanford, 94, formerly of Waterloo, died Saturday, May 1, at Cedar Falls Lutheran Home, Cedar Falls, of natural causes. She was born Dec. 16, 1915, in Northwood, daughter of LeRoy O. and Lois Hurd Schmidt. She married Glenn Blanford on Feb. 15, 1937, in Lancaster, Mo. He died Dec. 22, 1986. Mrs. Blanford graduated from Waterloo East High School, then attended Hawkeye Institute of Technology in nurses' training. She worked at Chamberlain Manufacturing Corp. for 12 years. 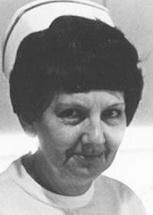 Later, she was a licensed practical nurse at Allen Hospital for 15 years, retiring in 1976 as head nurse. She attended Walnut Street Baptist Church. Survived by: two sons, Terrence of Waterloo and Buddy (Linda) of Delavan, Wis.; 11 grandchildren; many great-grandchildren; and two daughters-in-law, June Blanford of Cedar Falls and Sherry Blanford of Waterloo. Preceded in death by: son, Toby; a grandson, Michael Blanford; and two brothers, LaVerne "Barney" and Russell A. Schmidt. Services: 2 p.m. Wednesday at Locke Funeral Home, with burial in Waterloo Cemetery. Public visitation from noon until services Wednesday at the funeral home.